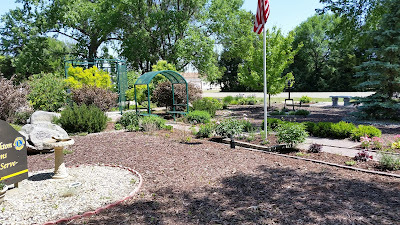 Having really enjoyed my time at the city park in Lyons, KS I sought out another city park that would be along my route north to cooler climes. 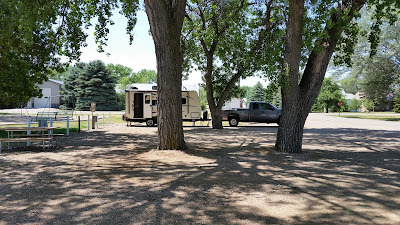 Using the Freecampsites.net website (an invaluable online resource for full-timers) I found that the small town of Britton, SD allowed overnight camping in their city park so I headed north. Britton (Pop: 1226) is about 20 miles south of the border with North Dakota along SD HWY 27 (27 actually is Main Street in Britton). 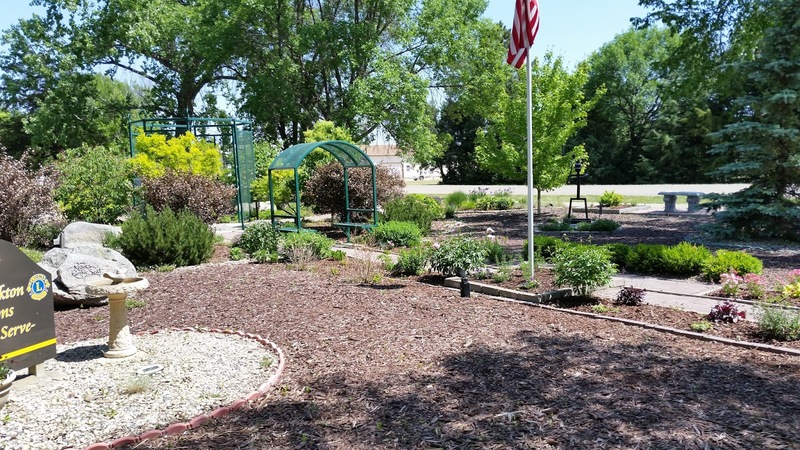 A pretty garden area in a corner of Britton City Park. 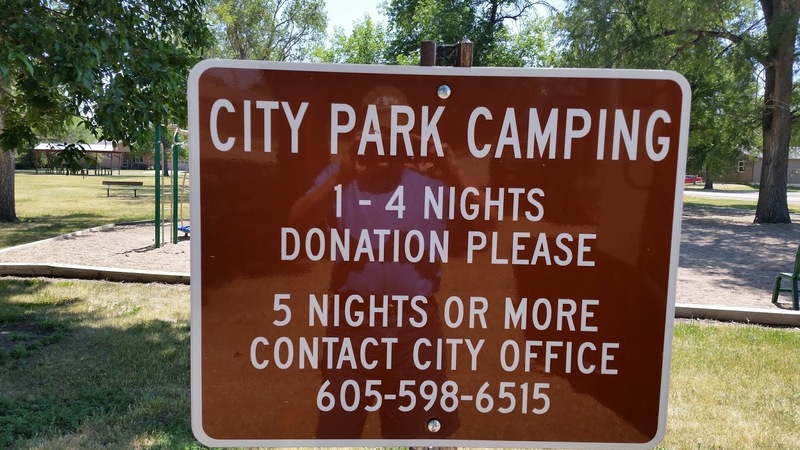 Previously the rules for camping in the park had been first three days free, $7 a night thereafter, but the town changed them to free camping but asked for a donation from campers for up to four days. I dropped a $20 in the deposit box. $20 for four days was a pretty sweet deal! The Mini's site under Britton Park's giant elms. 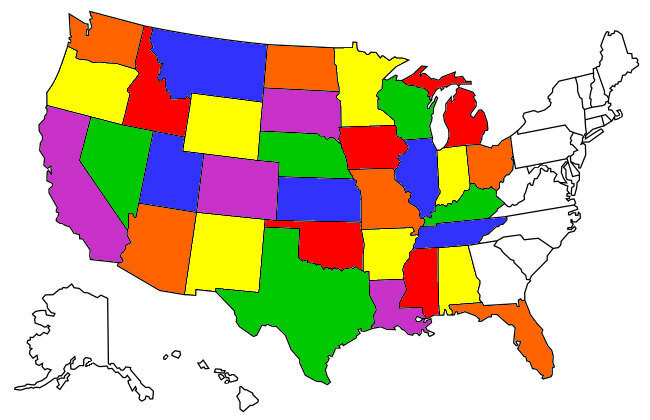 I usually try to contribute to a small town's economy if I'm staying there. There wasn't a restaurant in Britton, (which seemed crazy for a town of 1200, not even a Subway?) so I shopped a couple times at Ken's Food Fair which was only a block from the park. The weather during my four days at the park was just perfect, days in the 80's with light breezes and nights in the high 50's. The traffic in Britton is very light so I got most of my walks in without seeing more than a couple cars. I'm kind of surprised more small towns don't allow overnight camping in their city parks if only to keep RV'ers like myself from just driving through (and not spending any money) but way more prohibit it than allow it. Either way Britton City Park is a great place to stay for a few days if you're ever in the area, I'm putting it on my "Will revisit" list!